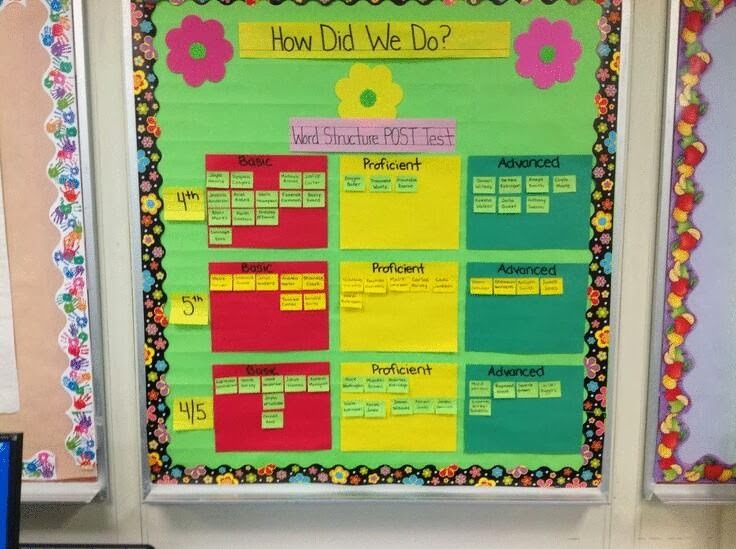 This picture has been scooting around twitter, just the most recently egregious example of one of the more odious techniques attached to the CCSS/testing regime-- the Data Wall. The data wall is a logical extension of Reformy Stuff's complete misunderstanding of how tests work and how human beings are motivated. A Data Wall makes perfect sense if you believe A) students are primarily Data Generation Units and B) human beings are best motivated by shame and bullying. The Data Walls were inevitable. After all, we're well past the point where we decided that generating a bunch of cool numbers with badly designed invalid junk tests and then publishing those numbers in the newspaper would be a most excellent way to motivate teachers. Why would we not want to do the same with students? Sure, everything we actually know about human motivation says that this is wrong. And the technique of combining useless tests, bad data, and public shaming has not yet produced any useful results in any of the school systems where it has been tried with teachers. But we've learned that one of the SOP's of the Masters of Reforming Our Nation's Schools is that when something you really believe clashes with reality, it is time to bash reality in the face. If your latest technique failed, then you don't need to adjust-- you just need to fail harder. Most of the examples that we have seen of this practice show at least a passing respect for privacy issues, or at least the lawyers who make money suing over them. And a while back somebody had a minor internet hit with a Data Wall about the educational qualifications of Gates, Duncan and Rhee (spoiler alert: none). But these things won't go away. A look at some of these terrible public displays of student results can and should be read over at Edusanity. 'And Valerie Strauss addressed the wrongness of it all last week. Data Dress Codes. If you are Below Basic, you must wear the Below Basic uniform, a sort of middling grey. Basic students may add black and white to the palatte. Proficient students may wear primary colors, and Advanced students can have a full range of colors, including tie-dye. Data Recess. If you are Proficient or Advanced, you can play a base or pitch in playground softball. Below Basic sit a special Below Basic Bench. Basic students play left field. But hey-- if rigorous shaming toward excellence is good for kids, why not apply it to adults as well. In Congress, we could have a giant data wall charting which legislators have passed the most bills. Or, since data walls often post meaningless junk data, lets post things like gallons of coffee used per office. Lets go to law firms and put a big chart in the lobby showing billable hours per lawyer. Let's make banksters start using transparent accounting-- so transparent that the accounting of each firm is posted ten stories high on the side of office buildings. Let's bring this into homes. At the end of each street, we can post data about each couple that lives on the block-- how much they make, how many times they make love per month, what they eat for each meal, how many times they've been ill, and from what, and lets collect the data from every source we can, including gossip and bad guesses. I mean, hell, we could just record all that information, every personal scrap of data, no matter how stupid, insignificant, personal, private, meaningless, important, whatever, from whatever source- no matter how unreliable-- and place that data in the cloud, to follow the people around for every day of their lives, visible to all sorts of people who get to decide things like employment and health insurance. Oh, no, wait. We're already working on that. Suddenly I get it. Data walls aren't just an indefensible abuse of children. They aren't just a way to make school a bit more hostile and unpleasant, a way to shame and bully the most fragile members of our society. They're also a way to acclimate children to a brave new world where inBloom et al track their data from cradle to grave and make it available to all sorts of folks. Where privacy is a commodity that only the rich can afford. Data walls are deeply and profoundly wrong. There is no excusable reason on God's Green Earth for them to exist. They may represent a small battle in the larger reformy stuff war, but they are a direct assault on our students, and they should stop, now, today. Mr. Greene, you are my new favorite blogger (second only to Diane Ravitch, and I thank her for introducing me to your blog). You are spot on with this post!! And everything you've written about that I've read so far. Thank you for boldly speaking the truth. I am a teacher and am so fed up! I feel sorry for the kids in that class, but even sorrier for the teacher that has been so demoralized herself/himself that he/she thought this was ok.
thanks for changing the background. my old eyes aren't flashing! I've seen the data wall used to shame teachers as well. If you're kids weren't "up to shnuff," what were YOU going to do about it? Why aren't they at level? These questions were asked of a teacher (whose data was "less than stellar") in front of an entire faculty. It was humiliating for that teacher... and horrifying to witness. Teachers are being forced by administrators to use these data walls! I have a friend who gets written up if she doesn't have hers up to date. Horrible!!! Bravo! Lets hope this message gains some serious momentum before Data Wall Syndrome becomes a diagnosed disorder for stressed primary students. "Why I Heart Common Core"